The biggest risk to the UK's economic recovery is that there will be no pick up in productivity, the head of the Office for Budget Responsibility (OBR) has told MPs. Robert Chote said that the economy also faced uncertainty from the eurozone, and from other geopolitical pressures. But he said the biggest uncertainty was how the so-called "productivity puzzle" was going to resolve itself. 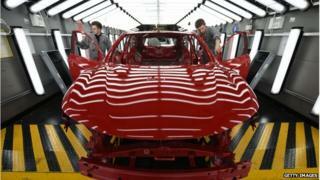 UK workers' productivity has remained weak, despite the economic recovery. Speaking to the Treasury Select Committee, Mr Chote added that while wage growth coupled with productivity growth was desirable, salary increases without any accompanying productivity growth was not a welcome development. Since the onset of the 2007-08 financial crisis, labour productivity in the UK has been weak, with this shortfall often called the "productivity puzzle". While the UK has seen an improvement in output, productivity has failed to rise in tandem - creating the "productivity gap" - and is below that of other developed countries. Mr Chote also told MPs that the amount of tax generated in the UK from economic activity had fallen. He said that while wage growth and consumer spending had increased, much of the UK employment growth had been in relatively low-paid work where people pay less tax. Peston: Is the UK more productive?